Young Asad Shafiq's brilliant 78 ensured Pakistan beat Zimbabwe by seven wickets via Duckworth-Lewis method in a rain-marred Group A match and qualify for the quarter-finals of the World Cup in Pallekele on Monday. Playing his first match in the tournament, Shafiq along with Mohammad Hafeez (49) added 82 runs for the second wicket to see Pakistan chase down the 162-run revised target of Zimabwe in 34.1 overs. 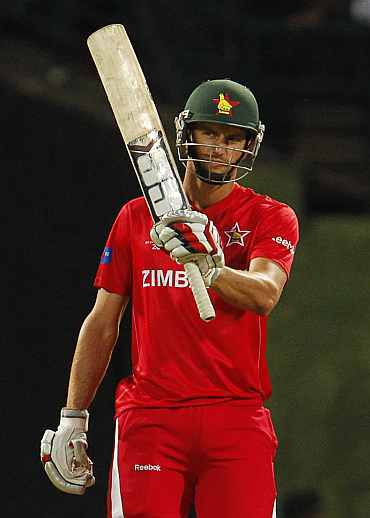 Zimbabwe, earlier, rode on a half century from Craig Ervine (52) to post 151 for seven in 39.4 overs. But Pakistan were set 162 for a win in 38 overs with the target being revised under the Duckworth-Lewis method after Zimbabwe innings was interrupted twice by rain at the Pallekele international Stadium. With eight points from four wins out of five matches, Pakistan are through to the next round, and will face world champions Australia in their last group match in Colombo on Saturday. 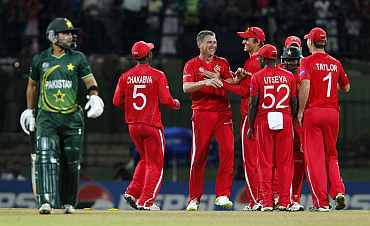 The defeat Zimbabwe, however, drew curtains to Zimbabwe's quarter-finals hopes as they have garnered just two points from their five matches. They will next face Kenya in an inconsequential group match on Sunday. Chasing the revised target, Pakistan lost Ahmed Shehzad in the fourth over, stumped by Tatenda Taibu off the bowling of Raymond Price (2/21) with the scoreboard reading 17. But the wicket failed to deter Mohammad Hafeez who hit Shingirai Masakadza for three boundaries in the next over to anchor the Pakistani run chase in the initial stages. After the early wicket, Hafeez joined hands with Shafiq to set the platform for the chase with an 82-run second wicket stand. But just when it seemed, Pakistan would comfortably march towards the victory off-spinner Prosper Utseya broke the partnership between Hafeez and Shafiq. Utseya dismissed Hafeez just one run short of his eight international half century, caught by Price at slip with Pakistan still needing 64 runs to win off 94 balls. Pakistan captain Shahid Afridi's decision to come up the order did not work as he was cleaned up by Price in the next over to bring Zimbabwe back into the match. Drafted into the team in place of an injured Umar Akmal, grabbed the opportunity with both hands and scored his only second fifty in ODIs in 76 balls. Shafiq's not only lead Pakistan's chase but also bettered his earlier personal best score of 50 he made against England in Leeds last year. Experienced Younus Khan (13 not out) then joined Shafiq after Afridi's dismissal and the duo ensured that there was no further damage to guide Pakistan home without taking any undue risks. Earlier, the bulk of scoring for Zimbabwe was done by Ervine, who hit five fours in his 82-ball innings and by captain Elton Chigumbura, who contributed an unbeaten 32 made from 46 balls with the help of two fours after opting to bat. 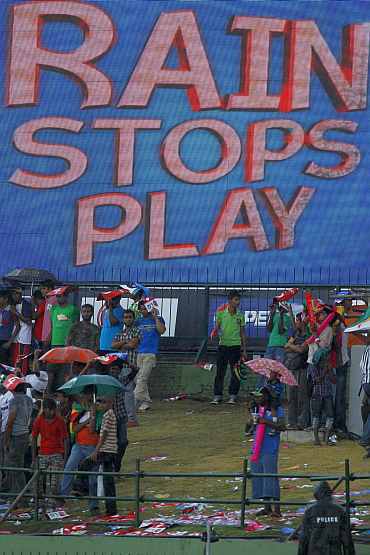 Zimbabwe reached 96 for five when a downpour that lasted for nearly 90 minutes forced the players indoors. The game was curtailed to 43 overs per side and with the Zimbabweans on 151 for seven in the 40th over another downpour ended their innings. After electing to bat, Zimbabwe were reeling at 13 for three and then slumped to 43 for four as the extra pace of Pakistani fast bowlers troubled them. A 41-run stand between Greg Lamb and Ervine followed for the sixth wicket and Pakistan captain Shahid Afridi, the highest wicket taker of the tournament so far, produced the breakthrough when he took a return catch of Lamb. Afridi now has 16 wickets in the tournament, four more than the second highest wicket taker Sulieman Benn. Captain Elton Chigumbura, celebrating his 25th birthday, then added 48 runs for the seventh wicket with Prosper Utseya. Chigumbura was unbeaten on 32 off 46 deliveries with two fours when rain came down. Umar Gul was the pick of the Pakistani bowlers finishing with three for 36 from his 7.4 overs. Abdul Razzaq, Afridi, Wahab Riaz and Mohammad Hafeez took a wicket apiece. 'CIA spy' Davis was passing nuke tech to Al Qaeda?